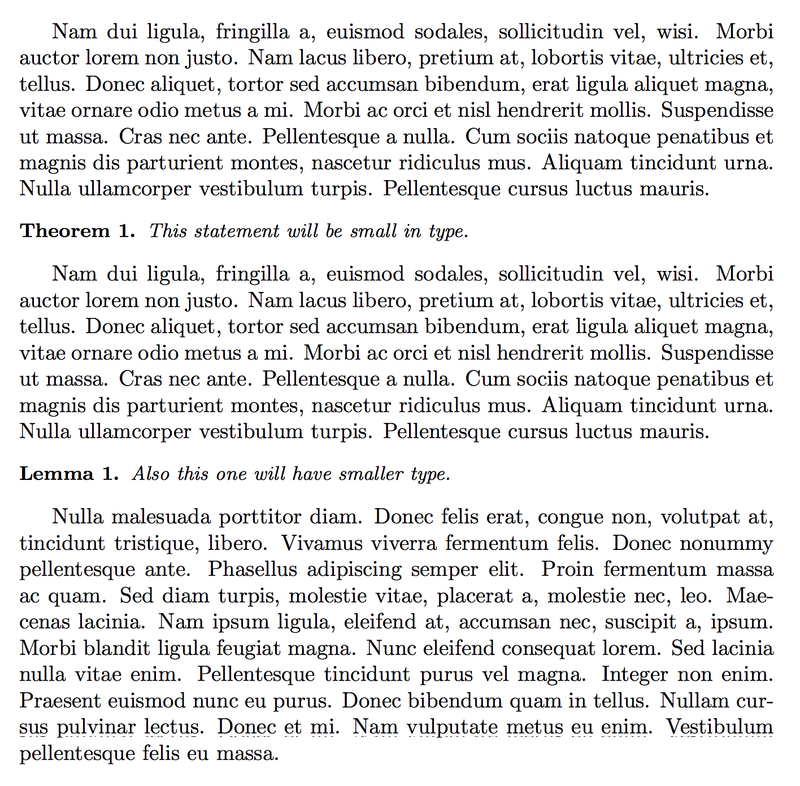 How to change the font size of all theorem environments? and I want to change them so that they all use "small" for font size. Is there a way to re-define the font size for all of these environments? In the following MWE theorem has both the header and the body in \small size, while definition has only the body and proposition is left as it was originally. Note that it works fine with amsthm and ntheorem as well. You can patch the command that's responsible for setting the statement. There are two different cases: (1) when no theorem package is loaded and (2) when amsthm or ntheorem is loaded. I never use the last package, but always amsthm. However, I don't understand why you'd want to do this in the first place. This statement will be small in type. Also this one will have smaller type. You could also look into thmtools and its preheadhook key for defining new theorem styles. Not the answer you're looking for? Browse other questions tagged fontsize theorems or ask your own question. How to change font size in the entire document?